Are you looking for a cheap internet promo bundles to fit your budget? Here's something new with Sun Cellular called Budget Surf promo where you can control your budget based on number of hours spent browsing over the web. What makes it more inviting is the expiry date of registration now made even longer than the usual unlimited internet promo. Each amount has its own corresponding validity period that starts from 1 day, 1 week up to 30 days. If you are familiar with Smart Bro Flextime surfing promo Budget surf is just the same concept with that. 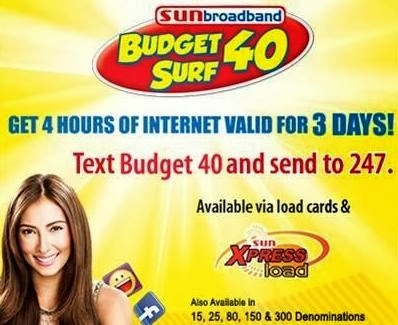 Like for example you subscribe to Sun BUDGET40 that gives you 4 hours internet surfing on your mobile and broadband, it doesn't mean that you get 4 hours of internet daily up to 3 days. Your 4 hours will be valid up to 3 days only, once you already consumed it Sun’s standard browsing rate will automatically apply once you connect to the web. Aside from key code registration or via text you can also directly load this promo via your nearest Sun Xpress load retailer. Do note that this promo is only available to Sun Broadband SIM card, if you're using ordinary sim this promo will not work. You can use your Sun Broadband, Pocket Wi-Fi or other internet capable device with Budget Promo as long as you use the broadband SIM. You can also register Sun Unlimited Surfing Promo using your regular SIM in case you want to avail unlimited internet browsing. If you think this promo fits to your needs and lifestyle then go try for it and give us your feedback and experience for other user’s information. Anung sasabihin kung magpapaload ka sa tindahan anung sasabihin mo? "ate pa load po, eto bayad"
After po magpaload, may internat na kaagad?